To keep our test garden growing strong through the winter, we’ve moved some of our favorite herbs indoors. 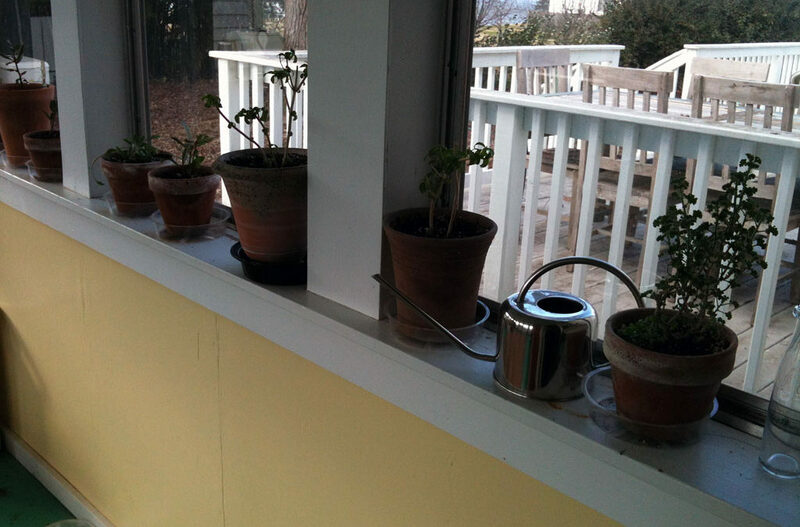 Our sun porch has become a haven for potted herbs and one of our favorite places to take a break or eat our lunches. Receiving lots of sunlight, our potted garden has been thriving throughout this mild winter here in zone 7. Watering about once a week, our plants are showing lots of healthy new growth and it’s not even spring! What started as a project to see what temperature and lighting worked best for these potted herbs, has now developed into a lovely place to relax and find a moment of peace during the day. Having these plants close at hand makes cooking and crafting even more enjoyable. Bring natural beauty and energy to your home with two of our favorite fragrant and functional potted herbs! 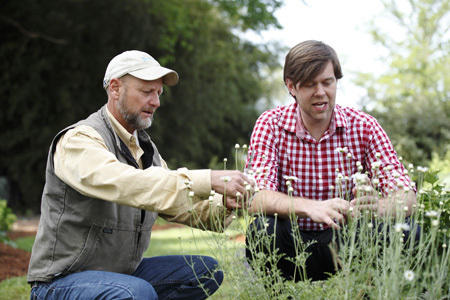 You Don't Need a Garden for Delicious Herbs! 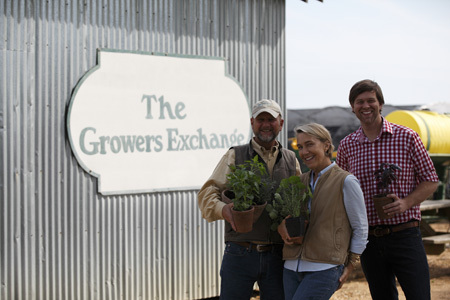 I’d like to take this opportunity, as many people throughout the country still await warmer weather before they can really start digging into the earth, to discuss my experience with container grown herbs . . .up close and personal. It’s is so easy to plant a potted herb garden that many actually prefer to do so, instead of trying to find space amongst the vegetables. Plus, this makes it easier to place the garden right outside the kitchen, which also makes the home cook happy. In order to make your own potted herb garden, use pots that are at least six inches in circumference, potting soil, compost, and a trowel. While some like to do smaller, individual pots, I like a larger potted garden, where plants can mingle. I recommend a large container. Mine is almost thirty inches in diameter, three-and-a-half feet tall, and sits tight against the house where it is well insulated. Once you plant the first crop, it will be easier to maintain. I have had one outside for the past 3 years, and I only need to fill in a few plants each year. In my area, we are considered Zone 7. Herbs such as Garden Sage, Italian Parsley, Kitchen Citrus Mint, and Marjoram do very well in this zone and will all survive year after year, if properly cared for. However, there are always those I have to replace each spring. For instance, I need to replace my basil almost every year, and my thyme died this past winter. As with any garden, there are a few persistent plants that will be more aggressive when fighting for space in the pot. You will have to be brutal with the mint, as it will take over the space if you let it. 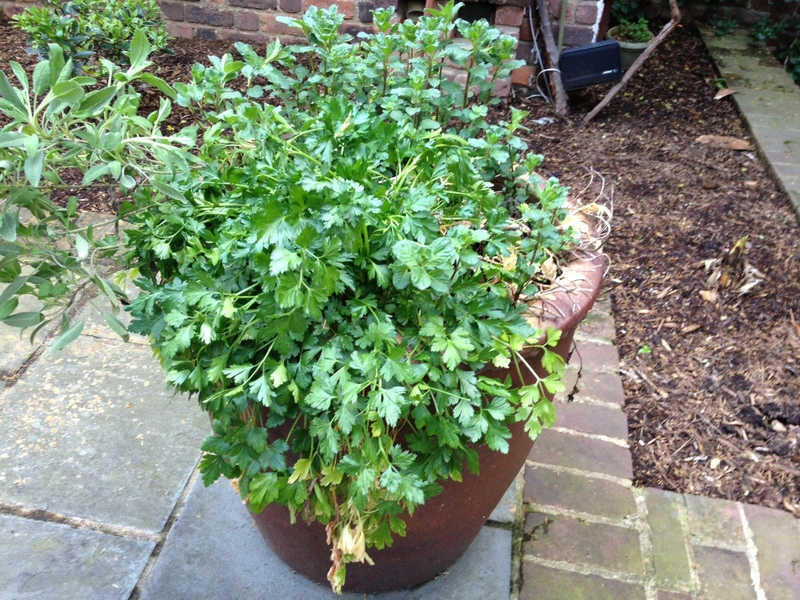 However, these hardier herbs are also survivors, and I am using parsley almost all year… and, of course, the mint. That’s not such a bad thing as I have discovered the value of minted water (I have a Brita and just keep a sprig or 2 in the bottom to flavor the water). 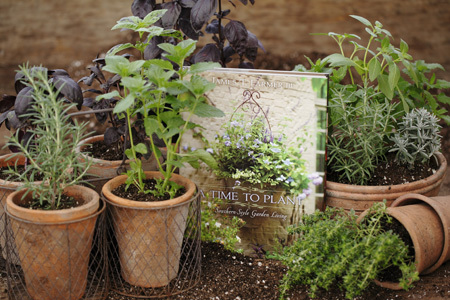 With your own potted herb garden, similar inspirations will only be a few steps away! As the sun began setting here in Zone 7 yesterday, I looked at my watch and couldn’t believe that it was only four o’clock! 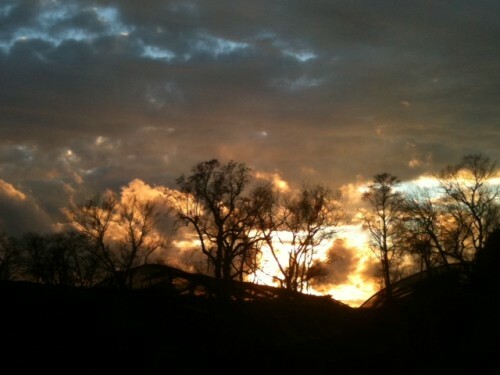 While the darkness descended around our farm, I thought to myself how depressing the winter months can be for gardeners. A severe decrease in sunlight plus plummeting temperatures are a bit of a shock after such a long, warm summer. 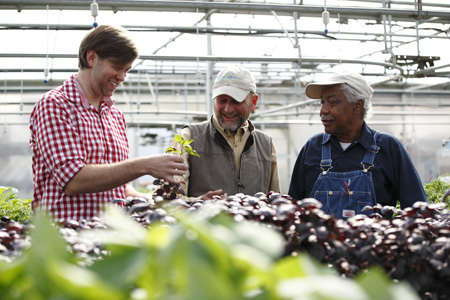 So, what is an avid gardener to do? Bring your herb garden indoors and make your own light! An ideal indoor lighting setup for growing herbs throughout the winter would be to have a ton of south facing windows with lots of space to line your herbs along the window sills. It might be useful to consider smart home lighting to have better control over your home lighting in these darker periods of the year and works well with this situation. If this scenario isn’t a reality, you can also line your ceiling with fluorescent grow lights to accommodate your indoor oasis while sunlight is scarce. 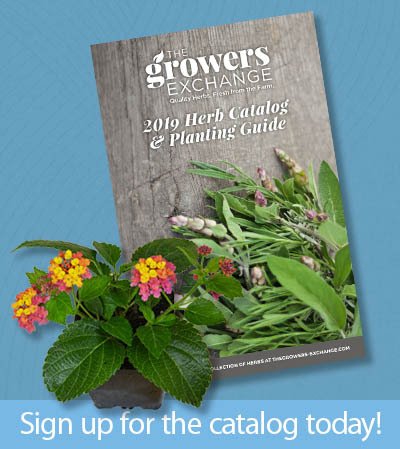 Though many herbs may go dormant, like Mints, as per their natural seasonal cycle, artificial lighting can extend their growing season and keep them useful. 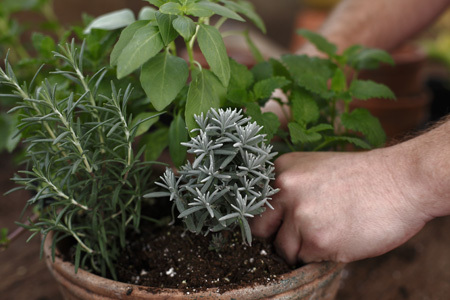 Most culinary herbs are well suited as indoor potted herbs, like Rosemary, Thyme, Chives, Winter Savory or Garden Sage, and tend to do well with supplemental light. Growing an indoor herb garden is a wonderful way to beat the winter doldrums and will provide you with fresh flavors until spring thaws the ground outside. Until the days grow longer, you can supplement your home’s natural lighting with fluorescent grow lights to keep your herbs growing strong all winter long. Many herbs tend to get a big leggy under fluorescent lighting, so make sure to keep them pruned well for better growth. Growing herbs indoors can also affect the water levels your plants need, so also pay close attention to the amount of moisture your herbs require to keep them from drying out. The type of pot or container your herb is growing in can also affect the amount of moisture it retains. Terra Cotta pots work well, as most herbs do not need a lot of water and the porousness of the clay allows excess moisture to escape. Mature herbs should be placed a few feet away from the light source, while sprouts may need to stay within a few inches until they get established. Florescents are more efficient than many other lighting options because they are much brighter and more narrow, and due to lack of surface space, they waste less. If you can afford the space for this endeavor, try lighting that falls between 4000 and 6000 Kelvin, a range that is warm enough to mimic the lighting environment of a greenhouse, without being too hot that it fries your herbs. 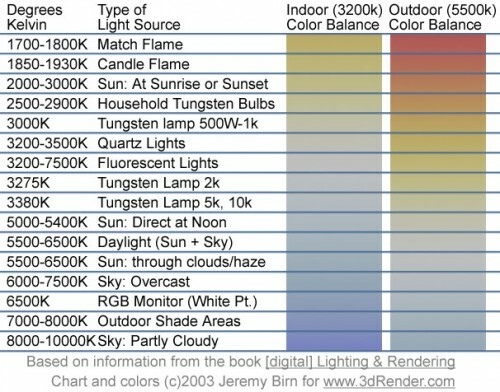 Color temperature is measured in Kelvins, and is an important characteristic of visible light- especially when we’re talking plants. The lower degree of Kelvin or color temperature, the more warm the lighting feels, and the higher the Kelvin, the cooler the light feels. Think of the difference between cozy warm lighting in your home versus the harsh, cold lighting of your doctor’s office. By choosing fluorescence that falls between 4000 and 6000, you allow for a healthy spectrum of warmth and color for most culinary herbs. (Some of the more tropical or sun loving plants like Stevia or Ashwagandha may take a bulb with a fuller spectrum of light). 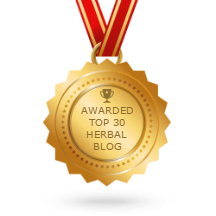 Many herbs need at least fourteen hours of light a day to stay happy indoors, and getting a timer for your lighting may be a good idea to help with this, as well as prevent them from running too long and wasting energy. Regular Trimming Will Yield Terrific Results! 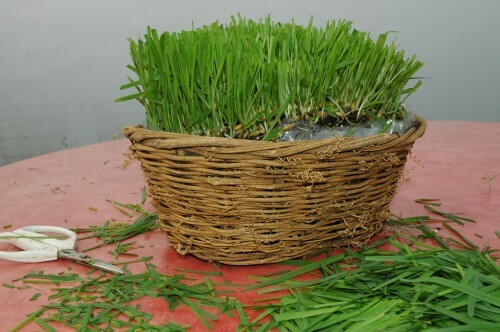 The grass in your Easter Basket, like the grass in your yard, will need periodic trims. 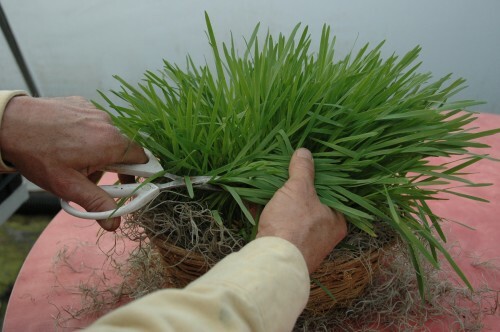 When your grass grows to be about 9” tall, give it a little haircut by holding a clump of blades in one hand and trimming off the tops with pruning shears. Be sure to snip the flat part of the blade, not the more round part of the blade near the base. Periodic pruning will encourage the grass to reinvest its energy into growing stronger, and it helps keep your mini “lawn” in lovely shape. Continue to keep it in a nice sunny window and with frequent watering and regular pruning, your Easter grass will last you long after Peter Cottontail has hopped off down the bunny trail! Stevia is difficult to grow from seed because many places do not carry stevia seeds and it can be difficult to germinate them at home- so let us do all of the hard work for you! 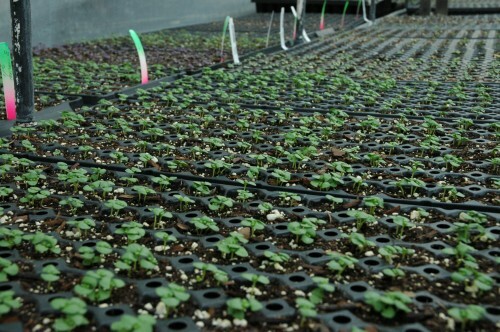 Our stevia plants are well-established and ready to be added right to your garden. Stevia is relatively sensitive to cold climates, so be sure any threat of frost has dissipated and soil temperatures are above 50 degrees before you plant outside. Stevia likes well-drained, rich and loamy soils. Add some compost to the top of your beds– the shallow roots will soak the nutrients right up. Are you a container-gardener? Stevia is quite versitile and will grow great in pots on your porch, balcony, or windowsill as well.